Despite great materials and a gorgeous screen, the average performance and so-so battery life keep it from being a slam dunk. How would you rate the EVO Design 4G? We'll just get it out of the way: you won't be wowed in the hardware department by the EVO Design 4G. That isn't to say it doesn't feel premium, nor well-made, but in a world that houses something as thin the Droid RAZR or an iPhone 4, we're left wanting more. Par for the course for smartphones from HTC, there really isn't much new or unique here, as the firm's design hallmarks have been remixed and rehashed into something neither offensive nor incredibly appealing. Yet, for what it lacks in flair, we'll commend the company in not skimping on materials. Unlike other Androids we know, there isn't a cheap weightless, or overtly plasticky feeling here, as the materials used -- brushed aluminum, glass and soft-touch rubber -- are, quite frankly, top-notch. The phone owes that sturdiness to its unibody construction, which surrounds the 4-inch display and its four capacitive buttons in one piece of onyx-colored brushed aluminum. That metal feels nice in the hand and clever use of oblique angles mask a little of its girthiness, which at a half an inch thick, again, borders on portly. Above that display lays a 1.3 megapixel front-facing camera and an elongated earpiece, which is also where a hidden status LED lurks. Circling back to the unibody frame, that same chunk of aluminum wraps around to the phone's backside, where you'll find the top and bottom have been milled to make way for two swaths of soft-touch rubberized goodness. Beginning with the top piece, you'll find the 5 megapixel camera protruding alongside an LED flash, a slender divot which houses a loudspeaker and alongside the left and top edges, a volume rocker, 3.5mm headphone jack and lock button respectively. Continuing with the second, more southernly, rubberized counterpart is where a microphone port on the bottom edge and a microUSB port on its right side call home. 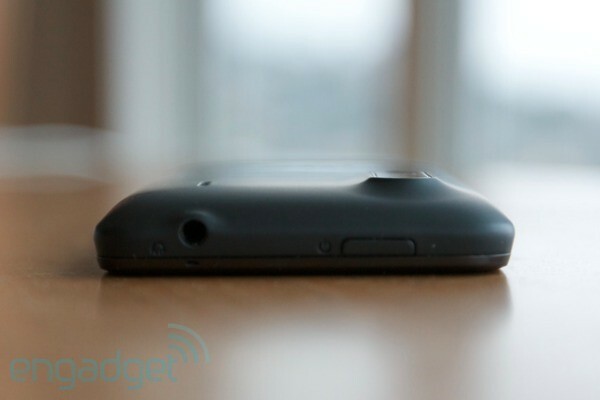 This entire rubber plate is removable, granting you access to the battery, SD card and mini- (not micro!) SIM slot. Did you catch that last bit? Despite it's stateside CDMA and WiMAX leanings, the EVO Design 4G will happily hang loose with GSM-brethren when taken abroad -- drinking freely from the 3GPP firehouse. 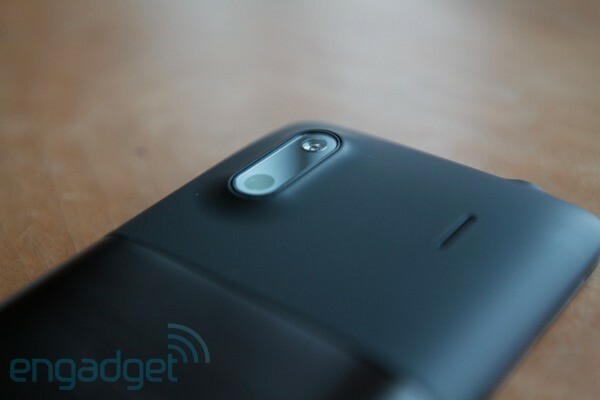 Besides thickness, our only major gripe with the hardware is that camera swell, and to be more apt, its protrusion. Because the housing extends significantly from the body, the phone never actually rests flat when set on a table, which when used in this manner leads to a frustrating rocking effect. Needless to say, you'll quickly adapt to not use it this way, but its a curious oversight that puts the camera -- the most fragile part of the exterior -- directly in harm's way. To recap then, at 4.8 x 2.4 x 0.47-inches (121 x 61 x 12 mm) it isn't class leading, but for the price not terribly un-impressive either. Yet, for this thickness, we'd expect a bigger battery and maybe dual-core -- both niggles which we'll delve into below -- but despite our wishes, size-wise it is -- just like its ancestry -- certainly within the range of livable. The front of the device houses its main attraction (and possibly brightest spot): the 4-inch qHD Super LCD display. For those unaware that's 960 x 540 pixels of vibrant goodness, which were ripe with color even at extreme angles. At 4-inches it's a smidge smaller than the displays on the original EVO and its 3D permutation, which won't be to the liking of those obsessed with sheer size. That isn't bad in our book, as the smaller quotient means more crispness, as the qHD resolution is squished into less space. No jaggies here, which is refreshing considering the sheer amount of AMOLED devices that pass through our grubby paws, suffer from sharpness issues thanks to their pentile construction -- cough, cough. And speaking of AMOLED, our minor critique of the display would be its black levels. It's unfair to judge levels of darkness achieved by an entirely different technology, but we'd be remiss if we didn't mention the only niggle of the EVO Design 4G's display. Yet again, for this price-range, and considering the display of the also $100 WiMAX Conquer 4G, you won't be disappointed. Just because it's down on sheer megapixels, doesn't mean you should count it out. Sure, there's no spiffy Amaze 4G wizardry, but the 5 megapixel sensor is a more than competent all rounder. Focusing is quick, even when taking macro shots which it handled aplomb. Capture time was equally snappy, and we were impressed with fast and relatively sharp shots. Colors reproduction can be a hit or miss and occasionally, if you aren't careful, you'll experience an oddly washed out shot. Still, as you'll see in the sample gallery below, for every so-so shot, there's typically a great one nearby. Just don't expect miracles in low light. While pictures were mostly enjoyable, 720p video recording was more of a mixed bag. Quick pans from left to right do produce a noticeable jello effect, which can be partially masked with slow and deliberate panning. Rolling shutter issues aside, the resulting video was ripe with color and changes in exposure happened at fairly rapid clip. Audio quality from recordings was definitely better, yet not something you'd write home about. As you're undoubtedly aware, good hardware is only as good as the software that runs on it. 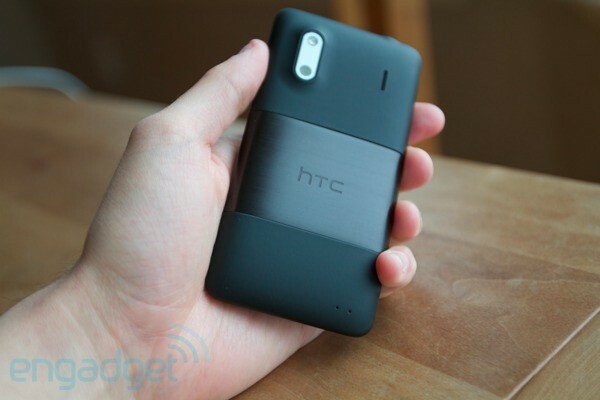 With that being said, this is an HTC, and that naturally means it's been skinned to the gills with Sense. The Gingerbread 2.3.4 tottin' handset has been layered with a visual design language that permeates through every part of the OS, replacing lock and home screens, the app drawer and everything in-between. But while there was once a time when Sense, dare we say, made sense, stock Android sure has come a long way since its humble G1 beginnings. That isn't to say there aren't those that'll find the additions tasteful or attractive, but we're dismayed by the additional overhead used to run such eye candy. 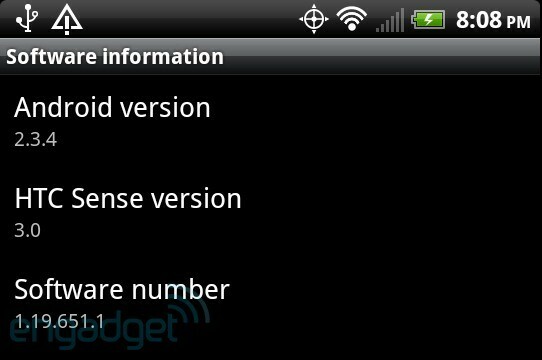 When compared to a Nexus S running Gingerbread, the impact is notable. It isn't unusable, per se, but scrolling in the browser and in the app drawer do occasionally give the single core 1.2GHz processor a noticeable run for its money. 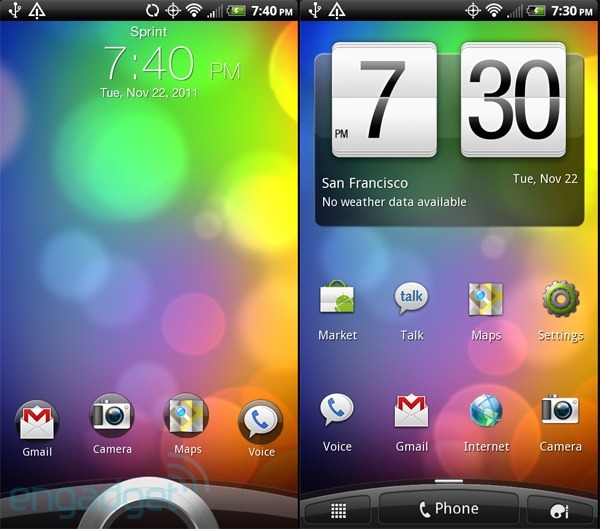 Consider yourself warned, then -- there isn't consistent iPhone 4 or Galaxy S II buttery smoothness here. Yet oddly, and like HTC's recently released Vivid, it makes do with version 3.0 of the skin, not it's latest rendition, 3.5, like on the Rezound or Rhyme. But other than minor tweaks that omission doesn't mean much, as you're still getting a bevy of HTC widgets and apps to clutter up that app drawer. 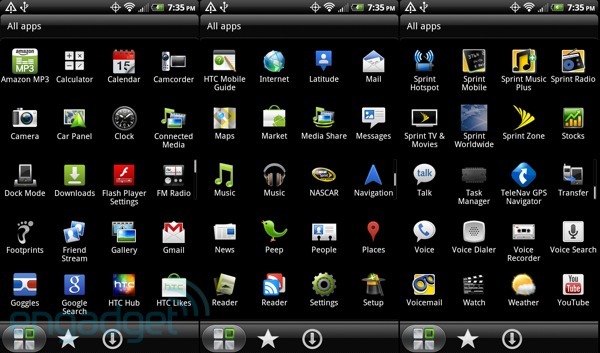 And speaking of clutter, being a non-Nexus, there's naturally carrier bloatware galore. We can't speak for you, but it irks us when we're forced to look at Sprint's Music, TV & Movies, Zone and of course the venerable Nascar apps right there, in our app drawer, every time we open it. Sure, a metric ton of you will root out of bloatware hell anyway, but frankly, you shouldn't have to. At least there's some solace in Sense's "Frequent" and "Downloaded" views that help you pare things down a notch. But there is hope on the horizon. 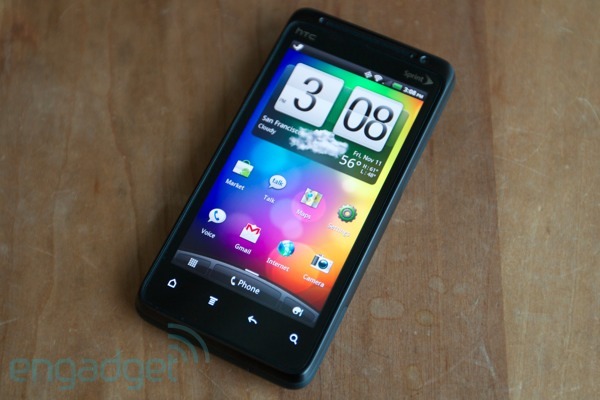 HTC's confirmed that the EVO Design 4G will get its very own upgrade to Ice Cream Sandwich at some point in the future. When that'll be, your guess is as good as ours, but we'll gladly take an official confirmation over naught. Whether or not Nexus Prime snappiness applies here remains to be seen, but here's to being hopeful. 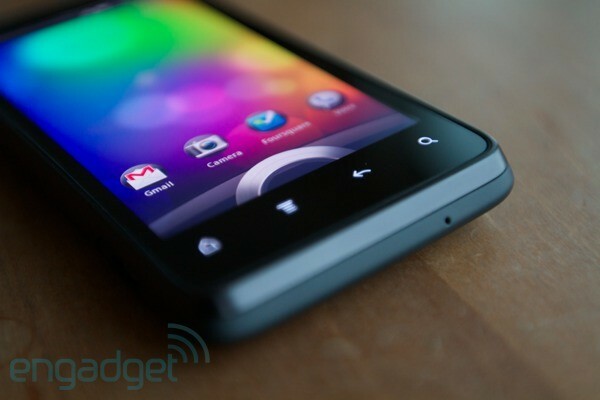 As noted above, for the smoothness we crave most skinned Android devices need at least a dual-core CPU to make them sing. The 1.2GHz Qualcomm Snapdragon MSM8655 tries as it might, but its a definite step down from the raw horsepower in dual core devices like the HTC Rezound or any Galaxy S II permutation. That deficit shows, as it performs admirably most of the time, but you'll certainly notice the occasional, seemingly random, stutter -- a consistent reminder, that you skimped on dual-core silicon. Most of the benchmarks, except for Linpack's multi-thread test, mask this disparity, but in real world usage, the step down in fluidity and performance delta is there and larger than the figures on paper would suggest. That being said, it does hold its own when compared to contemporaries that retail in this segment. But with outright performance compromised is there a silver lining in perhaps longer battery life? In a word, no. Even with moderate use, those seeking an all day charge better plan on packing that A/C adapter or budget for an additional juice pack. In Engadget's standard battery test, that loops a video ad nasuem, it managed a meager 4 hours and 15 minutes before running out of steam. Out in the real world, your mileage will vary drastically depending on which radio stack is in use. For instance, we've experienced lifetimes ranging from a paltry two and a half hour stint with heavy WiMAX usage to a more respectable seven to eight hours with moderate 3G usage -- naturally, with brightness dialed down to 50 percent and WiMAX switched off. Use it sparingly and you'll be fine, but those hoping for a the ultimate budget WiMAX bit-shredder should look elsewhere. And what an unfortunate conundrum to be faced with. If CDMA wasn't so routinely slow, we'd have no hesitation recommending WiMAX be switched off, yet with Sprint's network routinely pushing less than a megabit over 3G, we were often left wanting for more. Even when we braved it all in the name of outright speed, leaving 4G toggled on, performance with WiMAX was wildly unpredictable, ranging from 7 megabits on the high, to a half megabit on lows. An unfortunate side effect of rolling out the tech on 2500MHz, which significantly hampers signal any time you even approach building or any concrete structure. What was once impressive in 2010 has given way to frustrating in a world of LTE and HSPA+. Sure, Sprint's future seems brighter, but there's unfortunately going to be more pain before real gain. So where does that leave us? The EVO Design 4G is certainly a solid contender when vying for your Benjamin, yet we can't help but feel you'd be better off scrounging and ponying up for a more potent WiMax droid, like Motorola's Photon 4G or Samsung's Epic 4G Touch. The EVO Design 4G while well-made, ultimately is a phone trying to be the jack of all trades, yet comes out being the master of none. While plusses include affordability, great materials and a gorgeous screen, it's invariably overcome by negatives like questionable battery life and a hungry WiMAX radio that, for most of us, adds little. Being neither performant, nor frugal, makes its contemporaries shine that much brighter, especially when you consider something like the Epic 4G Touch can be had for the same $100 (if you're willing to look hard enough...), is faster and boasts a longer battery life. We suppose, if Sense is a must have and you're dying for a world phone touting WiMAX, there really isn't any other choice -- just think long and hard before you tie the knot for two years, okay?